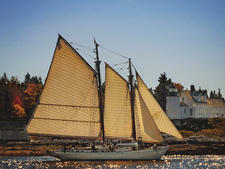 Coin collectors may recognize the Victory Chimes: The original three-masted schooner is featured on the official Maine state quarter, released in 2003. 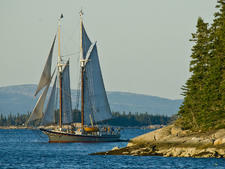 The ship has a rich history going back more than a century and is a National Historic Landmark. 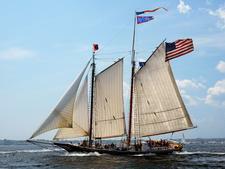 Originally called The Edwin & Maud, the schooner was built in Bethel, Delaware and launched in 1900 as a coastal merchant vessel. 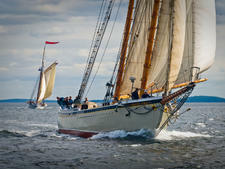 It was one of 30 “Ram” schooners, so called because of the way they “rammed through” the Chesapeake and Delaware Canal. During World War II, the ship's crew monitored the anti-submarine field at the entrance of the Chesapeake Bay and assisted the war effort by keeping a lookout for German U-boats. 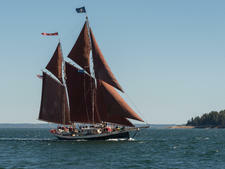 In the 1990s, Captains Kip Files and Paul DeGaeta purchased the ship and put her back to work as a windjammer. One of the captains -- and sometimes both -- will host each cruise. 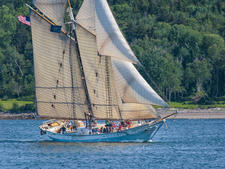 Victory Chimes begins the sailing season in early June and ends in late September, offering cruises between three and six days. Themed cruises include “Storytelling with Gary Crocker,” a Maine native known for his humor and knowledge of local folklore, climate change and geology along with wellness and music trips. All passengers on Victory Chimes must be 10 or older. The ship has 20 outside cabins with portholes that range in size. There are three cabins with multiple berths that are suitable for a family of four, four double cabins and single cabins. The standard cabin is 48 square feet with 9-foot headroom. All have hot and cold running water, reading lights, storage space and berths with comfortable mattresses, pillows, sheets and blankets. There are four bathrooms located above and below deck. There are three showers located on deck. Other amenities include push-button toilets and 110-volt electricity for hair dryers, shavers and cellphones. Victory Chimes also offers four suites for those who require more comforts, with double beds, hot and cold running water and a personal toilet. The decor is also more upscale. These cabins are available at a slightly higher cost. Victory Chimes passengers make their own choices when it comes to onboard activities. Exercise buffs can opt to swim or workout in the rowboat. 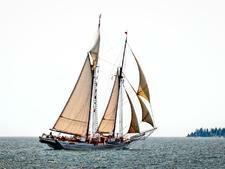 Sailors -- both experienced and not -- can help hoist and lower the sails. They may choose to learn or strengthen navigational skills by plotting the course with a provided compass and charts and GPS. The large deck offers plenty of room to sit and watch the sights and oversized deck mats for those seeking to sunbathe. Below deck is a library with books and board games. Breakfast and dinner are served in the main saloon. Lunches are usually served on deck. After the anchor is lowered each evening, passengers and crew gather on the main deck to mark the end of the day with appetizers provided by the ship. People are invited to bring their own soft drinks or spirits. The chef-prepared cuisine onboard features lobster and other hardy New England fare, including fresh blueberry pancakes.